Another great reason to visit Minneapolis! My favorite coffee roaster, Peace Coffee, has opened its doors at their new coffee shop, located on Minnehaha Ave.
And not only can you get you get my favorite brews, like Snowshoe Brew, you can also get fresh baked goods from Common Roots Cafe and the Wedge Co-Op! I suppose it’s fitting that I am a grad student and I like coffee. Ok, that might be an understatement. I need it. To function. When I was living in Bozeman, I would hit up the Daily Coffee Bar nearly once a day for a scone and a cup of brew (or a pumpkin spice latte, if the season was right). Since I am very passionate about buying and supporting local businesses, the Daily was right up my alley, because they got their beans from Yellowstone Coffee (distributed right out of Bozeman!). 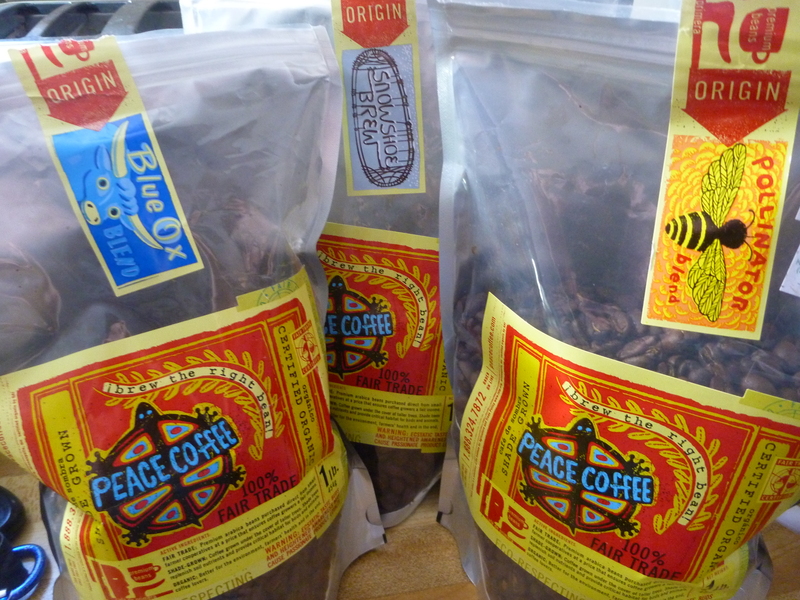 When I moved back to Michigan, I shopped at my local co-op, where I stumbled upon two regional coffee roasters- Twin Lakes Roastery and Peace Coffee. Now, I put my nose in the air to any coffee that doesn’t come freshly ground. Not shade grown? Not gonna drink it. If I am desperate, I may resort to a cup of Starbucks from the MUB, but that’s only if I forget to bring my french press to campus (the beans aren’t a problem- I usually keep a stash in my desk). So, now- I might actually classify myself as a coffee snob. And I am perfectly ok with that. Hello. My name is Megan, and I’m a coffeeholic. So it’s no surprise that I would often be rolling my eyes when my former office-mate would re-brew already brewed grounds in our office’s pot. It took all I had to hold back my gag reflex. I never offered to share my coffee with him. I thought it to be of the more deserving of tastebuds (see, I’m a snob). It could be that he had never experienced good coffee, and he was just fiending for some caffeine to keep his brain functioning. Or, it could be that he really didn’t have tastebuds. Whatever the case may be, I thought I’d share with my bloggy buddies some little tricks and tidbits about how to really savor your next cup of joe. Step 1: Pick the right bean. Finding the right coffee beans can be overwhelming. At first, it seems as if each brand has about a bajillion different types of roasts, beans, and origin. And in some instances, this may be true. Luckily, most companies provide a short description with their packaging to help along the way. Here’s a rundown of typical coffee roasts which dictates the flavor of the bean! Italian Roast – Not very acidic, almost bittersweet, Italian roasts go past the second crack of the bean in the roasting process. It’s one of the darkest roasts. Spanish roasted beans are practically black. French Roast (and espresso) – Second darkest bean that comes really dark brown. French is one of the most popular roasts. The beans are shiny, the flavor is upfront, bold (and non-specific), but not lingering. The flavor is a little “burnt”- crisp, and sometimes smoky. These include Turkish roasts and traditional “dark” roasts. Americans use this type of bean for espresso. These beans are roasted past the first crack, and sometimes just past the second crack. City Roast – a medium roasted bean, the flavors are bright, full, and acidic. Beans are stopped roasting after the first crack. Full City Roast – darker than the City Roast, lower acidity too. Italians use this type of bean for espresso, but its not to be confused with the dark Italian roast. It’s really only a medium level roast. Beans are between the first and second crack. Region types – Coffee beans are grown on coffee trees (tropical evergreen shrubs) between the Tropics of Cancer and Capricorn. Temperature (soil temperature around 28C) and humidity (+90%) are key components to growing this finicky crop. Different regions yield different flavored beans. There are so many, I’m not going to list them all here. But I will tell you my favorites! Ethiopian – (Yirgacheffee or Longberry) citrus and chocolate flavors, often roasted light or medium to preserve the lighter flavors. Ethiopian Sidamo is one of my favorite kinds of coffee, because its strong and full of flavor with a strong aftertaste. Sumatran – Very smooth yet full flavor, low acidity with medium-dark roast. Sumatran has a lighter aftertaste that doesn’t linger, if the beans are roasted right. Money-saving tip – Head to your local co-op and try the daily-brew they have available, or buy a small amount of whole beans from the bulk section. You can get enough to make one or two pots of coffee, and if you end up not liking the bean or roast, you aren’t out too much money (and aren’t wasting those beans). Step 2: Freshly grind your beans! I never buy already-ground beans anymore. Maxwell House and Folgers are a no-no. 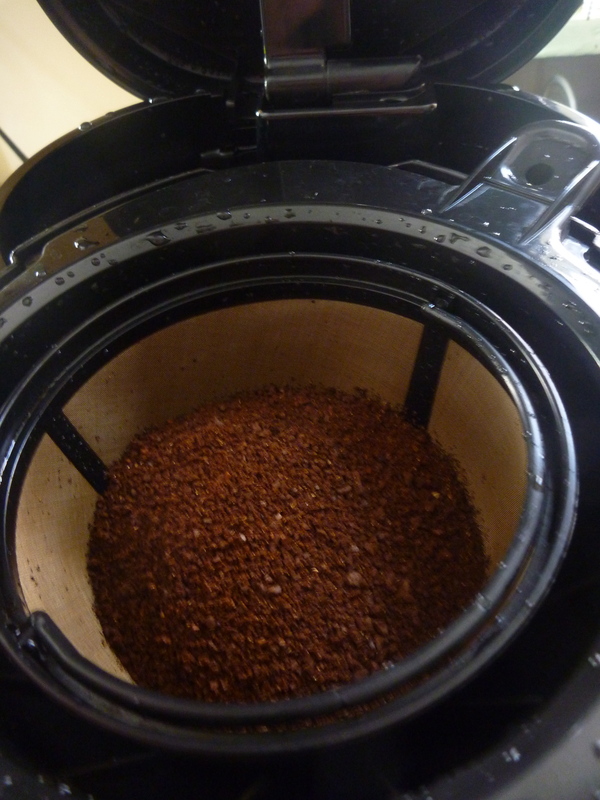 I have a nice coffee grinder from Mr Coffee, and I grind beans fresh every morning (or the night before if the coffee pot is set on auto-start). Other options include a burr mill or crushing the beans using a mortar and pestle. Depending on what style of coffee you’re going for, there are many different ways to grind. General rule of thumb: 1-2 tbsp coffee grounds for every 6-8oz water. I eye-ball measure it, and with our coffee pot (10cup) I’ve figured out that just below the grinder’s rim is enough beans. Don’t refrigerate your beans, either! Store them in a dark place (like in a cabinet or opaque container). Want a less bitter brew? Don’t grind up your beans too fine. Having bigger grounds (less surface area) reduces the strength of the coffee (and the amount of caffeine that is extracted), and reduces the bitterness. You can also limit this bitterness by choosing lighter colored beans (really dark beans are likely to be more bitter). Step 3: Go pure! Always use a clean coffee pot and cold, clean water. If your water has a chlorine taste, get a water filter pitcher (like a Brita) and use water from that to brew your coffee. If you are noticing your coffee quality is going down, clean the coffee maker with vinegar (grounds and minerals from the water can get into the coffee maker and clog things up!). Don’t use distilled or softened water. Step 4: Brew! Drip coffee makers are easy to use- just put the coffee in the filter, pour the water in the “tank”, close the lid, and press a button. There are other ways to do it, though. Steep– French press isn’t that much more complicated than conventional coffee makers, but the flavors are slightly different even with the same bean. These are the plunger-style coffee pots. They are little more messy compared to conventional drip coffee makers, and grounds are more frequently found in the bottom of the cup. 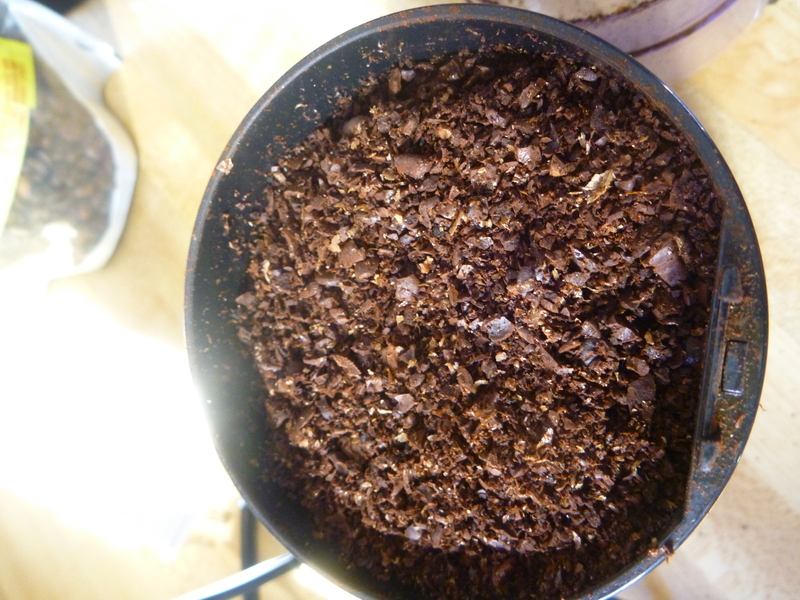 Using a coarse grind prevents the grounds getting through the plunger. I have a handy coffee mug that has a built-in French press. Probably one of the coolest kitchen tools I have. Pressure – Espresso is a different style of brewing coffee, not necessarily a different type of bean. To make proper espresso, one must have a high-pressure stream of hot water that is forced through tightly-packed (and finely ground) coffee beans. 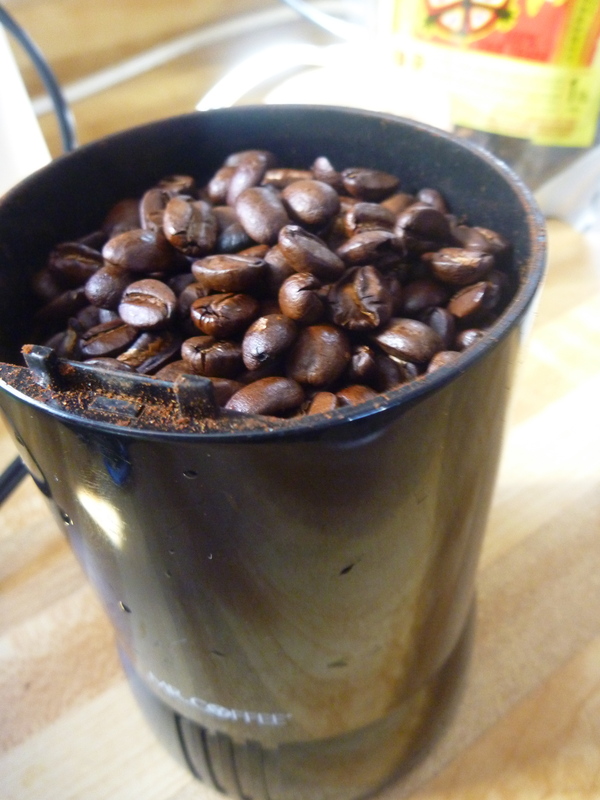 Turkish brew – A stove-top method for making coffee, this yields a strong and foamy cup of joe. Finely ground beans and water are boiled and then immediately removed from heat in a special pot called an ibrik. When I am at the office and don’t have access to an automatic coffee maker, I sometimes stash coffee filters in my desk drawer. I set the coffee filter in my big coffee cup and wrap the edges around the rim of the cup, and put a few tablespoons of grounds in the filter. Then, I fill up the cup by pouring hot (almost boiling) water over the grounds until the grounds make a sort of “soup” with the water. I let it sit for a few minutes, and then remove the filter. If the filter is big enough, it takes up about half the real estate of my mug’s volume, which makes my coffee a bit stronger (because the beans have more contact with the water). Step 5: Enjoy your cuppa joe! Whether its on a Sunday morning after a long run or before work during the week, take the time to enjoy your cup of coffee. Avoid just drinking it just to get your caffeine “fix”! There’s always five minutes to sip on a delicious cup of fresh brewed coffee and put your mind at ease before starting the day.